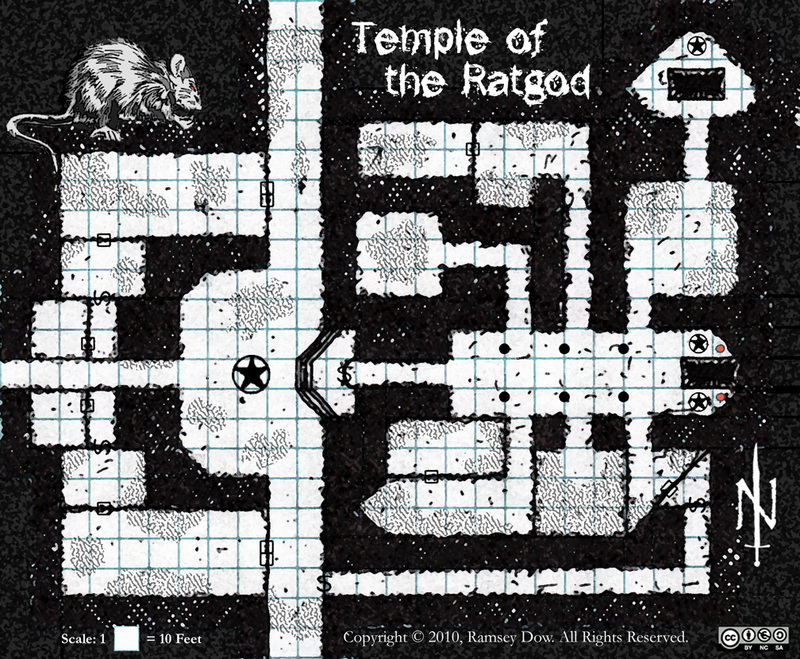 Deep beneath the Citadel of the Sorcerer-King, in dungeons long forgotten, lies the Temple of the Ratgod. Sequestered behind hidden doors are the temple chambers. The whole area is ruined, with walls and ceiling looking like they might collapse at any moment. The place is strewn with great piles of refuse. Rot grubs and disease are a continual danger in this dismal place. The Ratgod is ever-hungry for sacrifice. His slavering minions swarm the labyrinthine dungeons, skittering as they search for fresh victims. Those unlucky enough to be captured are brought back to the hidden temple where they are flayed alive, their skin cured and used for temple writings. Their flesh is shared by all in a sumptuous carnivorous feast, and their bones cast aside into blackened pits, forgotten by all but the marrow-sucking Tlaké beetles. They, too, shall have their feast.